There seem to be quite a few negative stories in the media about Athens these days: political uncertainty, economic woes and public discontent. But don’t let this coverage discourage you from going to the Greek capital: it’s still a great place to visit. 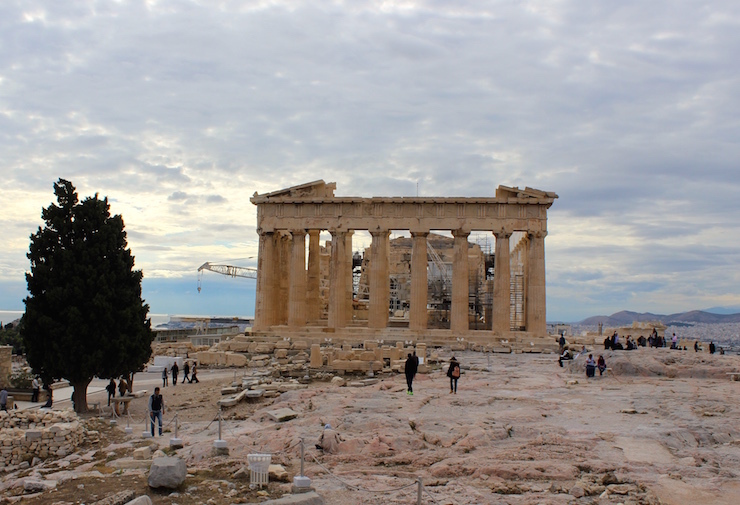 I spent four days in Athens with my husband and children (16 and 11 years old) during the October half-term holiday. We stayed in a spacious HouseTrip apartment (review here) about 10 minutes’ walk from Aghios Ioannis metro station. The first place we headed for in Athens was the Acropolis, a flat-topped rock which rises more than 150 metres above the city centre. 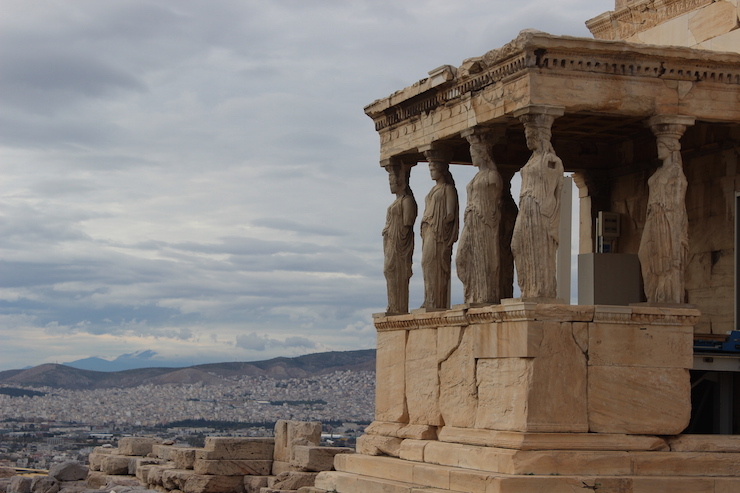 At the top of the Acropolis are various ancient Greek buildings including the Parthenon. Entrance to the Acropolis costs 12 euros which I thought was quite expensive until I looked closely at our tickets and realised that they included entry to six of the other ancient monuments in the city. We used the tickets over the next few days to visit some of the other ancient sites such as the Temple of Zeus. The kids grumbled about walking up the Acropolis but it really wasn’t that far and we cajoled them to the top. We were rewarded by seeing some beautiful buildings which date from 450 BC. Below the Acropolis is the separate Acropolis Museum. This is a beautiful modern building which houses objects and artefacts from excavations of the Acropolis. From the top floor of the museum and from its restaurant there are some fabulous views of the Parthenon. The restaurant serves delicious traditional Greek food and is a good place to wait with children while adults take it in turns to look around the museum, which is what we did. Lycebettus Hill is the highest point in the city. At the top of the hill are a 19th century chapel and a couple of restaurants. We took the funicular railway to the top but you can also walk up if you’re feeling fit, or take a taxi some of the way and walk the rest. At the top of the hill there are great views across the city to the sea. We enjoyed lunch there on the last day of our trip. Our daughter and I loved the Benaki Museum, my husband liked it but our son wasn’t so keen. The museum is housed in a beautiful mansion in a swish part of the city near Syntagma Square. 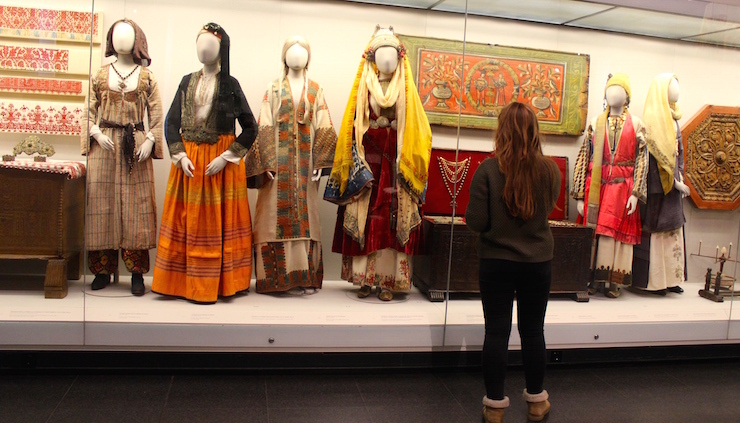 On display are thousands of fascinating objects of Greek culture from prehistory onwards. It reminded me of London’s British Museum but on a smaller scale. My daughter especially enjoyed looking at the historical costumes there. I just liked everything. Directly behind the Parliament building is the National Garden, a 38-acre city park. The weather wasn’t hot when we were in Athens but in the heat of the summer I think that this would be a good place to cool off under the shade of the trees. We walked through the park a few times and our son was thrilled to spot some turtles in a pond. There are also some duck ponds and a children’s playground in the park. Not far from the Acropolis, Plaka is an area of whitewashed houses and higgledy piggledy streets that looks more rural than city. 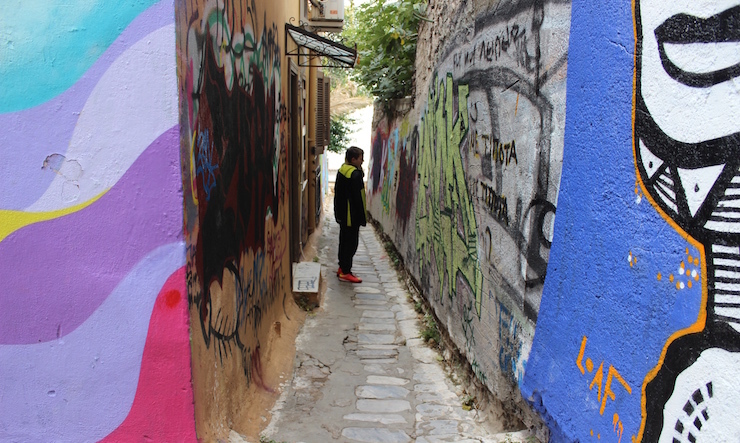 Much of Plaka is pedestrianised and we enjoyed walking around the streets and exploring. Our daughter was impressed with the graffiti art which we saw there although our son felt that it was all a bit dodgy – we live in the countryside and he’s not used to seeing street art. You can take a tram from the city centre to to Flisvos Marina and look at the huge yachts moored there. We were taken to the marina by a local man who we were put in touch with through Athens Insiders, a group which organises tours led by Athenians rather than tour guides. There are shops and restaurants at the marina and it’s a pleasant place to walk around. Athens local Anna Atsalaki told me that you can also take a tram along the coast but we didn’t have time to do that. Anna shares tips and ideas for families visiting Greece at her website Kids Love Greece. The centre of Athens is compact and easy to get around. We walked a lot and also used the excellent, efficient Metro network. We used five-day tickets which cost 10 euros and are valid for the city’s buses, trams, and underground and overground trains except for the train to the airport for which you need a separate eight-euro ticket. We also used taxis quite often as they were ubiquitous and cheap – each taxi journey that we took seemed to cost about two euros which we rounded up to five euros because that seemed fair. We had some wonderful food in Athens. Our favourite place to eat was at a tiny restaurant near the Acropolis museum called Liondi. The food there was fantastic and the owner, Stavros, was so great with the kids that they wanted to eat there all the time. The food at the Acropolis museum restaurant was also good for breakfast and for lunch. You can eat there even if you’re not going to the museum. We also found that the bakeries in Athens were very good for buying fresh bread, pastries and pies. A useful tip which I read in the Marco Polo travel guide to Athens is that locals don’t look at menus in restaurants and prefer to ask the staff for recommendations. We did this with Stavros at Liondi and he always came up with delicious dishes for us. I think that Athens is great for a family city break. The people that we met in Athens were kind and friendly (I’ve written about their kindness here), we saw some amazing things, ate some delicious food and felt very safe. Disclosure: HouseTrip provided our accommodation in Athens. I really, really hope to get to Athens one day, I have seen Agrigento in Sicily which was a taster, now I need to see the real Athens. Mari recently posted…Mini Christmas pudding trifles – leftovers! You definitely do, it’s a great city. I have always wanted to go to athens – we have stopped over but only ever seen the airport! I have never been to Greece before but my mom has been several times. I would love to visit and immerse myself fin it’s history. My Greek friend lives in Athens, and I’ve really enjoyed my trips to see her there. I have fond memories of spotting a wild tortoise, making its way through the grounds of the Acropolis! The country has a lot of difficulties, but they do really look after their tourists. What a lovely place to visit – just our kind of place, with the food, history, culture and just about everything. Added to our (very, very long) list…. I’d love to visit Athens – it looks beautiful. Cass@frugalfamily recently posted…Don’t fall into the Christmas trap…. This is one of the places on my To Visit list – I always wanted to go to Athens and I hope one they I will ended up there. I hope that you get the chance to go there one day! It’s a very interesting place to visit and the people are lovely. Yes, yours may be a bit too little! It is somewhere I would love to visit, I am a culture vulture rather than a beach dweller and love anywhere with plenty of history! I like the beach too but trips to places like Athens are great. It’s been a few years since I visited Greece and I’ve yet to take my children and I cannot wait. It’s a beautiful country and your post makes me even more determined to go! Greece is a lovely place to go with children, we found it very welcoming. You don’t really hear much about Athens. An interesting read, thanks Greta. I would certainly consider going there now. I love holidays that combine history with sightseeing.